Our commitment is to offer the latest in golf technology at affordable prices. The products we sell are designed and manufactured to high quality standards, without needless advertising campaigns and professional endorsements. Our direct to the customer business model saves time, money and allows a high degree of customization. GigaGolf sells equipment that incorporate the very latest in golf club technology. The heads are made in many of the same foundries that make heads for nationally advertised, tour player endorsed brands. Shafts are specified to be premium quality made for GigaGolf clubs by only the best shaft manufacturers. By keeping our attention to quality high and our spending on advertising and distribution low, we are able to offer golf equipment at an unparalleled value. 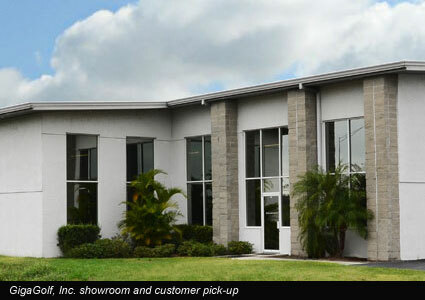 GigaGolf is conveniently located between Tampa and St Pete. Our showroom gives golfers the opportunity to view the equipment in person before deciding to buy. But remember, the GigaGolf 30 day play guarantee does the same thing for customers that cannot visit our showroom to see the quality we offer. Showroom hours are 10am to 4pm EST Monday through Friday.